MELBOURNE has further bolstered its backline, giving Collingwood VFL defender Marty Hore his opportunity at AFL level by taking him with pick No.57 in the 2018 NAB AFL Draft. Along with Sam Collins, who was selected by Gold Coast as a state league priority signing in October, Hore was the pick of the defenders in the VFL this season. 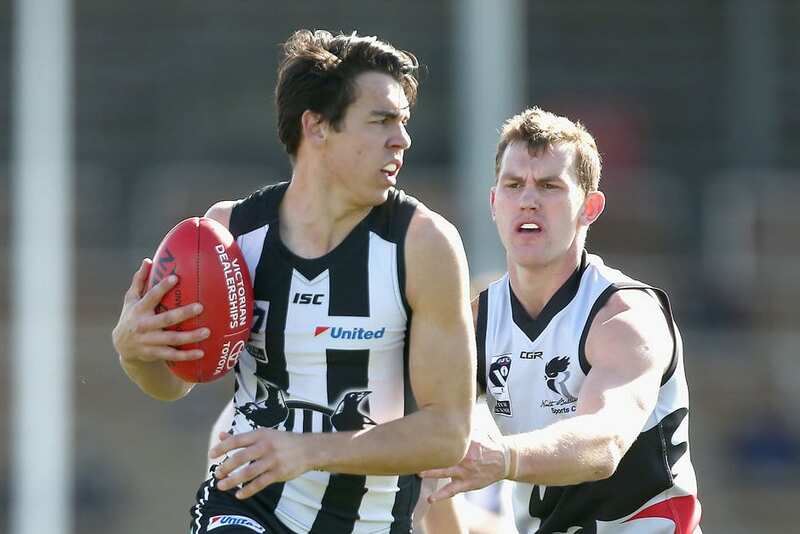 Hore won Collingwood's VFL best and fairest award in 2017 and backed it up again in 2018, with his ability to intercept mark the feature of his game. Demons national recruiting manager Jason Taylor said Hore had been on the club's radar for a number of years after he first playing with the Bendigo Pioneers in 2015. "We watched Marty in the TAC Cup when he played with Bendigo and we went out to his farm that year and interviewed him, so we've tracked him every year since," Taylor said. "Like a lot of the guys that make a successful transition from the state leagues to AFL level, they're able to progress each year and they improve their areas of deficiency." The 22-year-old uses the ball effectively and will be ready to play next year for the Demons if called upon. Hore, who stands at 189cm, adds important depth to a backline that added Steven May from Gold Coast in this year's NAB AFL Trade Period, and contains the likes of Oscar McDonald, Sam Frost and Joel Smith. Earlier, Melbourne leapt into the draft for the first time on Friday, selecting South Adelaide midfielder Thomas Sparrow with pick No.26. But the Demons' selection of Sparrow, who averaged 21.9 disposals at under-18 level in the SANFL, came only after they put a bid on Western Bulldogs father-son prospect Rhylee West. The Bulldogs were quick to match the bid for West which then saw the Demons settle on the South Australian product. Sparrow spent much of his time in the 2018 Under-18 Championships floating across half-back and averaging five tackles per game. The Demons are fans of his ruthless attitude, earning their interest with his second and third efforts at the contest. "We wanted to address the midfield and we were pretty keen on Tom given that he's a speed and endurance athlete," Taylor said. "He's got some real upside in his athleticism … there's a bit of synergy there because the coach (Simon Goodwin) is a South Adelaide boy, so it's a good story for the club." Melbourne followed the selection of Sparrow by grabbing midfielder/forward James Jordon with pick No.33. Jordon, who hails from the Oakleigh Chargers, was a late starter to the TAC Cup competition after moving down to board at Caulfield Grammar from Yarrawonga. Jordon is a versatile player and a sharp decision maker, with a penetrating right boot and played some senior footy with Yarrawonga before moving down to Melbourne. "What attracted us to James was his improvement throughout the year. He didn't have a lot of exposure to TAC Cup level, but when you pour back over the vision you see a player who can play in all areas of the ground," Taylor said. The Demons selected midfielder Aaron Nietschke with pick No.53, after becoming big fans of his ability to run all day and slot into multiple positions. Taylor said the Demons recruiters got lost venturing out to Nietschke's family farm near Tanunda in South Australia, a small country town of approximately 4800 people. "They're pretty isolated out there in Tanunda but we're pleased to bring Aaron to the footy club. "Siri took us down a dirt road, so I blame Siri for that one."